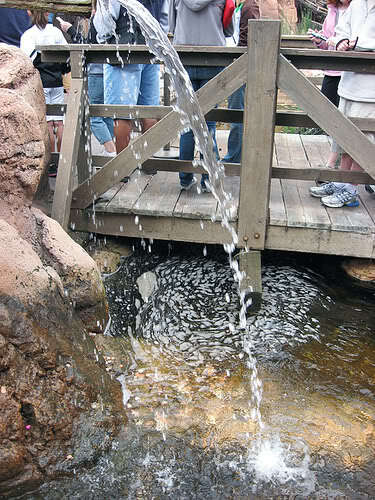 I was in line at Big Thunder Mountain and made a wish on a nickel at the pond. I wished to meet a guy who liked Disneyland and was straight. That night I got talked into going to the birthday party of a childhood friend I hadn’t seen in a while, and I met his cousin. On our first date, as the lights were about to go down on our second movie of the night, The Cousin casually mentioned that he had a Disneyland Annual Pass. I was like, “Wait – wha…?! !” and then had to wait 2 hours to talk about it! …Next time I go on Big Thunder Mountain, I’m wishing for a Ferrari! The Fateful Waterfall... Nickels Only! That really is such a magical beginning to your relationship! I can’t wait to read the rest of your story. Hi Carrie. I’ve been enjoying your TR’s for a few years now- your wedding one and the Tokyo visit are my favorites. I LOVE the story of how you and Patrick came together, and it made me think of how my fiance and I met– at the tequila cave in Epcot! We were both there with a mutual friend. I bought a giant sombrero to wear for the upcoming ‘Crazy Hat Day’ in my Kindergarten class; let me tell you, those things are top heavy and not comfortable to schlep around the World Showcase. John ended up wearing it all day for me, and when we danced to Herman’s Hermits during the Flower and Garden Festival Concert Series, I knew he was a keeper. He had a Seasonal Pass, I an Annual, and when I informed him (jokingly- sort of) that I only date Annual Passholders, he went the next day and upgraded. I’m so proud of his Dis-nerd that has emerged. He even proposed at Animal Kingdom Lodge during an ‘anniversary’ weekend stay. Disney couples are the best! I love it! A ginormous sombrero brought you together… funny *and* romantic! And what a great place for a proposal! p.s. This story is amazeballs. How many couples can possibly say that Big Thunder Mountain Railroad brought them together?! I think, as a rule, most everything needs more kittens! I can’t believe nobody has commented yet. That’s an adorable story. LOL! Yeah, come on, people! What more could you WANT in a proposal story?! Fireworks? Herald trumpeters?! Kittens?!! …It’s kittens, isn’t it?